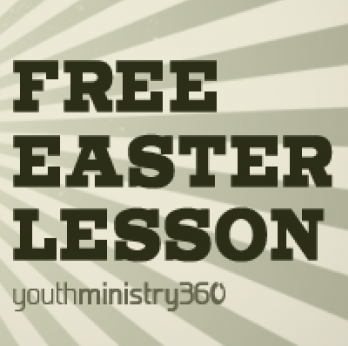 The fine folks over at YouthMinistry360 have some great freebies for your youth group teaching this Easter. Visit their Easter Vault to download 3 free lessons and 10 free student devotionals. It’s a great little treat to stick in your Youth Ministry Easter basket. Lesson 1: Encounter: Death. Life. Forgiveness. Purpose: Challenge teens to remember why Jesus did what He did and what was accomplished through His sacrifice, and to formulate a response to Jesus’ death and resurrection. Purpose: Help teens see how God wove a thread of redeeming love through the Bible, culminating with the greatest expression of love, Jesus’ death and resurrection. Purpose: Challenge teens to fully grasp the impact Christ’s resurrection has had on their lives by helping them articulate their response to Christ’s resurrection, and how it has affected them personally. Purpose: Help teens get prepared for Easter by looking at a chronological view of the events surrounding Jesus’ last days on earth. They will help your teens prepare their hearts and minds to celebrate Christ’s resurrection.